On Monday, the world reacted in horror as the nearly 900-year old Notre Dame Cathedral in Paris was nearly completely destroyed by fire. Horrific flames quickly engulfed the entire core structure, and after 2 hours, the iconic spire collapsed, along with most of the roof and its 210 tons of lead. Here's what we don't: What caused it? Well the media seems to have focused on one reason, and one reason only: the cathedral was "under construction" -- a reported $7 million project lasting years, and scheduled to complete just this year. Therefore the most logical reason, absent obvious foul play, is a "construction accident." Given the scope of the renovations, it is quite likely a "welding spark ignited paint thinner" or any other cause widely speculated in media reports, that can typically occur on a busy construction site. But there's just one big problem with that. My dad's house burned down when I was a kid due to faulty wiring. I'm not ruling out terrorism though as that was my first thought. So, if there were “no construction workers on the site”, ho was there - after the tourists were locked out? Terrorism and conspiracies are oh so much sexier than a careless construction worker. Spontaneous combustion? A bunch of rags soaked in a solvent heaped together near a wall? Nothing to see here. If you say Muslims did it, then you’re an Islamophobe and attacking Omar. 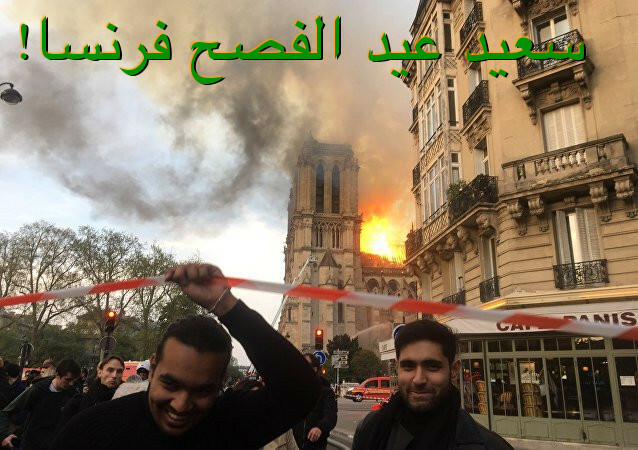 So let’s just all change our Facebook page to say “Je suis French” and tag a photo of a peaceful Muslim and denounce ALL hate (especially those mean-old whyyyte peoples) and then everything will be hunky-dory until the next massacre/destruction by Islamofascists. Certainly make for better explanations than a careless construction worker, when no construction workers were present and the building was closed. multiple times they tried to burn THIS church, and took out 4 score others in 2 months. and ... why are they laughing? would you? French reports say the fire was found just minutes after closing for tourists. Perhaps a backpack secreted in a corner with some phosphorus in a glass jar? Remove the lid and let it smolder in the pack? I read that in a spy novel book once. Previous attemps...Easter week...muslims want to take over the country and Europe...yeah, construction accident...yup. If a news article starts with a meme, it isn’t an actual news article. Over here we had 9/11. Looks like they just had their 4/15. It's time for folks to tell the muzz apologists skum to just stuff it, they are not believable any longer. During the Great Fire of London in 1666, St. Paul’s Cathedral was totally destroyed. Basically the same thing happened, burning wood ceiling frame, and melting lead destroyed much below. When the fire had first started, many people had moved their property, books, etc., to the vault in the Cathedral’s vault for safe-keeping.The fire was so intense that it burned through the vault, and everything within was lost. Many burials in the vaults below were also destroyed due to the fire. It is like a metaphor. Even if it IS arson, the authorities will never admit it. Jihadis are a protected class in Europe. They’d better find or else set up a backstory fast. Or, maybe it was just an accident due to fire of a torch or even wiring. A guy slips and drops a hot torch and screams and runs away. Problem: If there were workers exactly, precisely at the point of the fire’s origin, then okay. But, what if their Facebook and Instagram and other information mysteriously got deleted? And trips to and from Syria and Iran were simply vacations? And intensive Islamic studies were due to inspiration only? Still, I would hate to be the guy who accidentally set such a fire and ran away. Can you imagine that predicament? Go to THIS thread and read the endless light hearted comments from FReepers. Then ask the exact same question about the FReepers. Don’t get me wrong, I’m not defending Muslims, but a couple of laughing Muslims isn’t exactly proof that the fire was arson.